Love Nature; the two words behind Antipodes. This award-winning, scientifically validated, organic Kiwi brand, supplies a range of certified, green beauty products. With pure plant fragrances, using a cutting-edge combination of the highest quality ingredients from New Zealand, and raw super-fruit extracts, along with science and innovation, Antipodes produce high-tech certified organic and premium formulations. The award-winning vegetarian skincare range delivers outstanding results for helping support production of collagen, elastin and antioxidant activity. 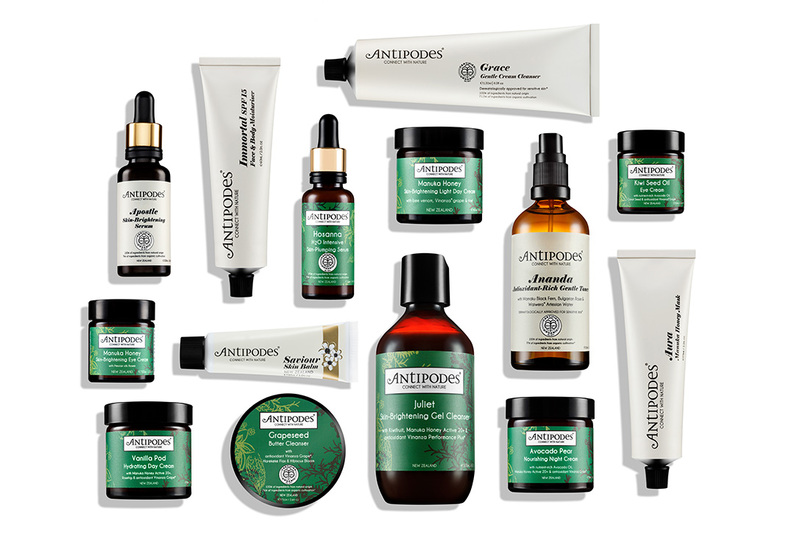 Boasting high concentrations of luxurious natural ingredients like avocado oil, Manuka honey, kiwi seed, jojoba oil, chia seed oil and a selection of potent New Zealand botanical extracts, you’re bound to feel naturally luminous with the Antipodes skincare essentials. This award winning Manuka Honey Mask is a deeply moisturising, cleansing, anti-oxidising treatment. Ideal for blemish prone skin, this luxurious hydrating mask powerfully draws moisture to the skin, keeping it fresh and blemish free, whilst the lush infusion of Vanilla pod and Mandarin will be sure provide you with an ambiance of peace and balance. Smooth thick layers of this creamy mask over your face and neck twice weekly. Leave for 15 minutes then rinse with warm and pure water, to reveal beautifully hydrated skin, with a youthful, radiant glow. Also ideal for treating spots and blemishes as they may arise. Maintain youthful-looking, supple skin, with a daily dose of healthy antioxidants that are packed into this powerful serum from Antipodes. This supreme organic skin booster features New Zealand grown super fruits, blessed with some of nature’s highest concentrations of anti-ageing antioxidants, including Boysenberry, Blackcurrant and Kiwifruit, plus revolutionary antioxidant Vinanza Grape, promoting a healthy complexion that protected against environmental aggressors. Dispense onto your fingertips and apply to your face, neck and décolletage daily before moisturising, to defend the skin from signs of premature ageing and oxidative stress. Rich in Vitamin C from the New Zealand super fruit Kiwifruit, this luscious, yet light eye cream contains elements of nutrient rich Kiwi seed oil, Vinanza Grape and Avocado Oil, that work to sooth and hydrate skin, soften fine lines, whilst defending against environmental aggressors. Soothe the precious area around your eyes every morning and evening, by using clean fingertips to pat on gently, for a smoother, more refined eye contour. This nourishing formula blends the bioactive botanical ingredient Kiwi seed oil with nutrient-rich Avocado oil to help keep the skin of the lips healthy and hydrated. Ultra-rich in Vitamin C and Omega 3, this conditioner helps to keep lips soft and plumped in appearance, as it protects against water loss and increases the surface lipids. Apply as a primer and conditioner under your favourite lipstick, or as an instant moisture boost at any time of day. This superior restorative facial night cream contains native New Zealand Manuka honey, which draws moisture to your skin, whilst acting as an antibacterial, to clear blemishes and prevent new ones from occurring, to help bring a truly ageless result. With revolutionary Vinanza Grape, to help neutralise the effects of free radical damage that can lead to premature ageing, along with the pure plant fragrance of Ylang ylang, Jasmine and Sandalwood, this powerful cream will leave you with beautifully soft, nourished skin. Apply on an evening to your face, neck and décolletage after cleansing and toning, for ultimate revitalisation. This sensational, soothing hand cream is perfect for the cold winter weather! Honestly natural, and non-greasy; packed with all of the nutrients of New Zealand grown avocado oil and golden kowhai, while nurturing Marigold oil helps reclaim the ultra-dry skin of working hands. Rinse your hands in warm and pure water, dry gently and apply cream at regular intervals, to keep your hands feeling incredibly soft to the touch. Indulge in this light, luxurious body oil, packed with rich, healthy, certified organic oils of Avocado, Macadamia, Jojoba and Rosehip, which absorb easily into your skin, leaving it as smooth as silk. With the heavenly pure plant fragrances of Jasmine, Lavender and Ylang ylang, this organic formula is intensely rejuvenating and nourishing, whilst being incredibly lightweight. Smooth over your entire body after you bathe in the morning, or any time after sunset. Suited to most skin conditions, especially ultra-dry. Enriched with a balancing blend of Chamomile and Lavender, this clarifying facial toner is specially formulated to reduce the appearance of enlarged pores and balance the skin’s surface. Beautifully refreshing, it encapsulates the positive energy of sweet sage, offering immediate moisture and hydration to stressed skin. Spray abundantly, several times a day, across your face, neck and décolletage for an instant moisture boost and relief from environmental aggressors. Detox your skin with this radiance enhancing mask, fortified with mineral-blessed volcanic mud from geothermal New Zealand, revered for its regenerative brilliance. This luxurious treatment effectively draws out dirt and impurities, to reveal luminous and deeply cleansed skin. Lavish a thick layer over your cleansed face and neck, avoiding your eye area. Leave for 15 minutes, and rinse away thoroughly with warm water. Use twice a week religiously. South Pacific Hibiscus flower freshens your complexion, while berry fragrance conveys pure joy. Suited to normal, dry and mature skin conditions, apply at night to your face, neck and décolletage before your favourite moisturiser.